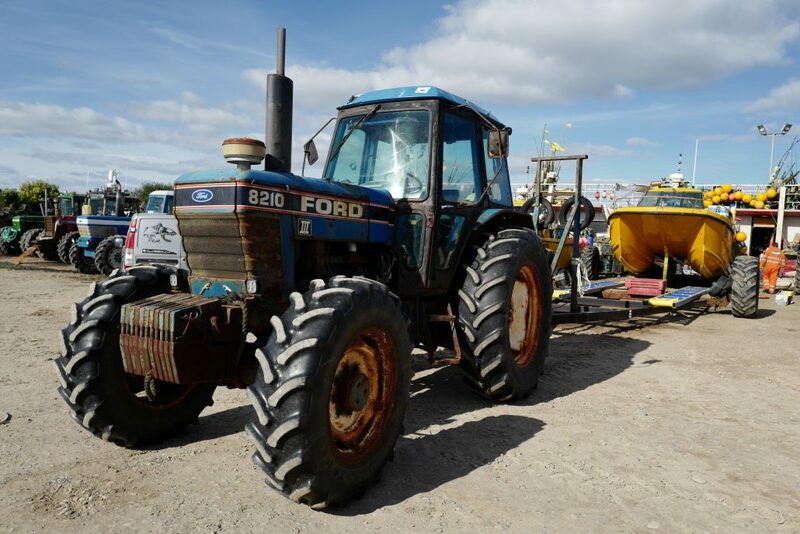 Awarded funds towards the purchase of tractor which can be used as a back-up by all of the Hornsea fishermen. This project was financed as a voluntary donation jointly made by the Walney, West of Duddon Sands and Ormonde offshore wind farms. The Kilkeel Strategic Partnership (KSP) has members from both major Irish Sea Fish Producer Organisations (NIFPO & ANIFPO), local seafood processors, local businesses and the Kilkeel Chamber of Commerce. The Project Officer will co-ordinate the attraction of public and private funding to further develop the economic output of Kilkeel port and upgrade the harbour facilities. The ambition of the KSP is to significantly increase income and generate new jobs within the port of Kilkeel. Based in Kilkeel, N.Ireland, Sea Source Processing Ltd is wholly owned by the Anglo-North Irish Fish Producers Organisation. Sea Source Processing Ltd processes scallops, Nephrops and whitefish in its own modern quayside premises and is now a major buyer of locally caught fish, helping to ensure that competitive prices are paid to the fishing industry within Northern Ireland. The awards have provided significant help towards the purchase of a scallop washer, a fish skinning machine, a grading machine, a pallet wrapper, an in-line conveyor, power washers, software to computerise and control intake, weighing and despatch within the processing lines. The funds also helped to purchase a prawn dip line, stainless steel weighing scales, stainless steel freezing trolleys and an automatic stripping machine. Additionally funds were provided towards the purchase of a new chiller and small building extension. This project was financed by donations made in 2017 (Agreed Donation) and again in 2018 and 2019 (voluntary donations) in return for co-operation of the fishermen during the construction and operation of the Walney Extension offshore wind farm. Both NIFPO (Northern Ireland Fish Producer Organisation) and ANIFPO (Anglo North Irish Fish Producers Organisation) were awarded funds to part finance young fishermen from the Irish sea ports to undertake vocational professional training to achieve the Class 2 certification (2nd hand full). The training, taught in Greencastle, Republic of Ireland, lasts for 16 weeks. The men have to forgo work to undertake the course of study and receive no wages for the duration of the course. Both NIFPO and ANIFPO were keen to encourage and support the men to gain this qualification to further enhance their careers within the industry, hence this particular award. This project was financed by Ørsted as an Agreed Donation in return for co-operation of the fishermen during the construction of the Walney Extension offshore wind farm. Sea Source Processing Ltd (as wholly owned subsidiary of ANIFPO) benefits all those who land to the organisation, which includes fishermen from the County Down ports of Ardglass, Kilkeel and Portavogie. The packaging equipment adds value to the landed shellfish. The refrigerated van enables Sea Source produce to be delivered to customers in prime condition. This project was financed as two voluntary donations made in 2015 and 2016, both of which were provided jointly by the Walney, West of Duddon Sands and Ormonde offshore wind farms. The Whitehaven Fishermen’s Cooperative were awarded funds to commission a feasibility study for a facility to process and add-value to under-utilised fish species (notably small plaice) landed from the Irish Sea. The study was carried out by a team of specialist consultants and is of potential interest to all fishermen who operate in the Irish Sea. MADE in Mourne is a ‘Creative community space’ project based in Kilkeel, the fishing capital of Northern Ireland. It is an initiative established by local business community leaders (including ANIFPO) and is co-financed by the West of Morecambe Fisheries Ltd (WOMF), The Newry Rural Development Programme and Newry, Mourne and Downe District Council. The company aims to stimulate and foster opportunities for young entrepreneurs in the local community, by providing them with support in their professional development and creating an environment that promotes peer support and strong networking. This project was financed by Ørsted as an Agreed Donation in return for co-operation of the fishermen during the construction of the Walney Extension offshore wind farm. Photography by Scott Kershaw (www.scottkershaw.co.uk). The Fishermen’s Mission in Fleetwood exists to serve the fishing communities of Lancashire and Cumbria. The Area Officer and Pastor of the Fleetwood Fishermen’s Mission is the Reverend George Ayoma. The Mission is there to support individuals and their families who may have been involved in an accident, are taken ill, face poverty, bereaved or simply need someone to talk to. Funding has been provided to finance the installation of a new shower facility, make essential building repairs and towards the ongoing running costs of the minibus. This project was financed by a voluntary donation from the Walney Extension offshore wind farm. Photography by Scott Kershaw (www.scottkershaw.co.uk). Funds were provided to the fishing company (B and M Fishing LLP), based in Fleetwood (Lancashire) to assist its fishing operations in the exploitation of the non-quota fish resource, the common whelk (Buccinum undatum) (2016). 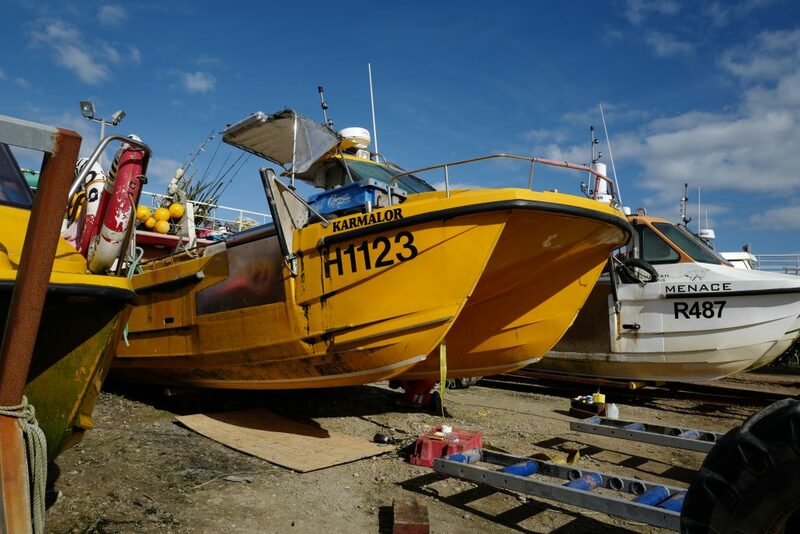 The company presently operates a fleet of four fishing vessels. This project was financed as a Single Business Agreed Donation by Ørsted in return for co-operation of the fishermen during the construction of both the Walney Extension and Burbo Bank extension offshore wind farms. This group of seven fishermen came together to apply for funding for insulated fish boxes and safety equipment (life rafts and EPIRBS). The Group are a collective of independent fishermen from various East Irish Sea ports. The four fishermen were also awarded funds to purchase a landing winch to lift their catches from their boats to the dock side, as well as funds for insulated fish boxes to help preserve their catches while onboard. Located within Fleetwood, funds have been provided to purchase a new shellfish holding tank facility. The tanks use circulating sea water to keep fishermen’s catches of shellfish (crabs and lobsters) alive and healthy over a sustained period. The facility will be available to those inshore fishermen from Fleetwood who are targeting such shellfish and who wish to use it. By prolonging the shelf-life of catches of live crabs and lobsters, the fishermen can potentially access markets that may be otherwise unavailable. This project was financed by a voluntary donation from the Walney Extension offshore wind farm. The Holderness Fishing Industry Group (HFIG) were awarded funds to secure the services of Dr John Terschak, an internationally recognised expert in research aquarium design and operation. Dr Terschak studied analytical chemistry and marine sciences at universities in New York and Alaska, USA and has worked with the Bodega Marine Laboratories (California) and The John G. Shedd Aquarium (Chicago). He has led a number of projects involving shellfish species all over the United States, and in recent years within the United Kingdom through a partnership with the University of Hull. He has been recruited by HFIG to oversee the construction and operation of a new lobster hatchery and research facility, which is to be sited in Bridlington. This project was financed by Ørsted as an agreed donation which forms part of a co-existence plan between the Westermost Rough offshore wind farm and local fishermen. The fishermen in the Holderness Coast Fishing Industry Group (HFIG) have been awarded funding from the West of Morecambe Fisheries Ltd to help cover the costs of some safety equipment. Further details to follow soon. The holding photographs below will be updated once this project is completed. Alternative Fishing Methods. The Yorkshire Wildlife Trust (Dr James Wood) is leading on a study to investigate the potential for local pot fishermen to diversify within their traditional fishing grounds and target under-utilised species in the area (i.e. Holderness coast, E. Yorkshire). The study will test the potential of alternative fishing methods, such as flat-fish traps, squid fishing and trammel nets. This work is being carried out in collaboration with local fishermen from the Holderness Fishing Industry Group. Sourcing pot bait locally. Dr Wood will also seek to evaluate the potential for fishermen to catch pelagic fish locally, for use as bait for their traditional crustacean fishery. The holding photographs below will be updated in 2018 as this project is completed. The Holderness Fishing Industry Group (HFIG) were awarded funding so that they could continue to undertake their own research into the state and health of the local populations of crabs and lobsters off the Holderness coast, East Yorkshire. These species are vitally important to the local fisheries based out of Bridlington, Hornsea and Withernsea. The catches of these species generate many £ millions for the local economy as well as providing work for hundreds of fishermen and processors in the local community. This project was voluntarily financed by Ørsted in recognition of the positive relationship between the Westermost Rough offshore wind farm and local fishermen. The Holderness Coast Fishing Industry Group have been awarded funds to support the post of Scientific Officer. The Scientific Officer is employed within the HFIG organisation and is responsible for the delivery of research which has a primary focus on the long term sustainability of local crustacean stocks. This project was financed by Ørsted in return for co-operation of the fishermen during the operation of the Westermost Rough offshore wind farm. The eight fishing vessels in Hornsea are all launched from the beach. The fishermen rely on tractors to haul their vessels from the nearby fishing compound down to the water and to recover them again at the end of the day. 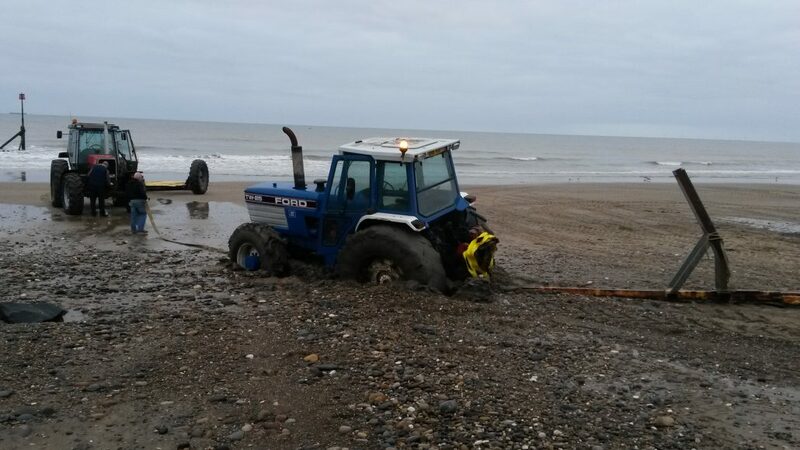 Each vessel has it’s own tractor, but if a tractor breaks down, which is an unavoidable hazard of working in such a harsh environment, it’s vessel may be unable to put to sea, causing the crew to lose a day’s income; or may have difficulty getting off the beach, putting the vessel at risk. 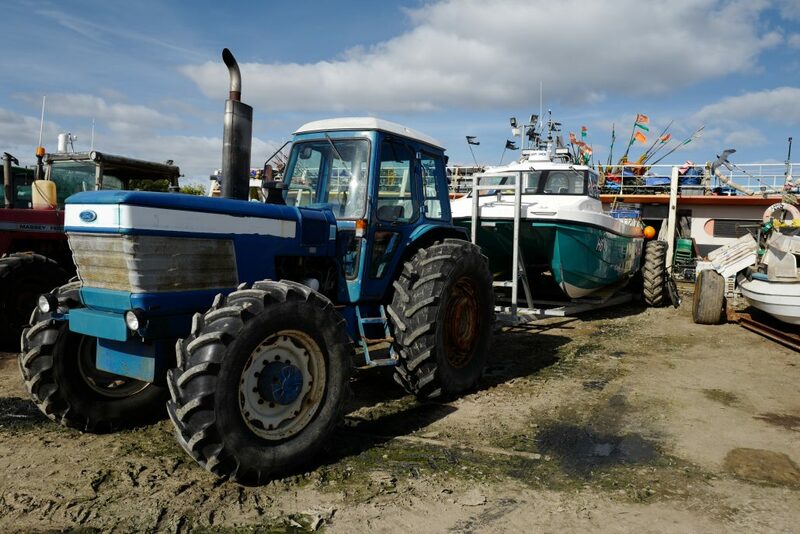 This funding helps towards the purchase a tractor and winch, which is to be jointly managed by all of the fishermen of Hornsea as a back-up in the event that one of their individual vehicles breaks down. This will ensure all vessels can always be sure of getting safely in and out of the water. 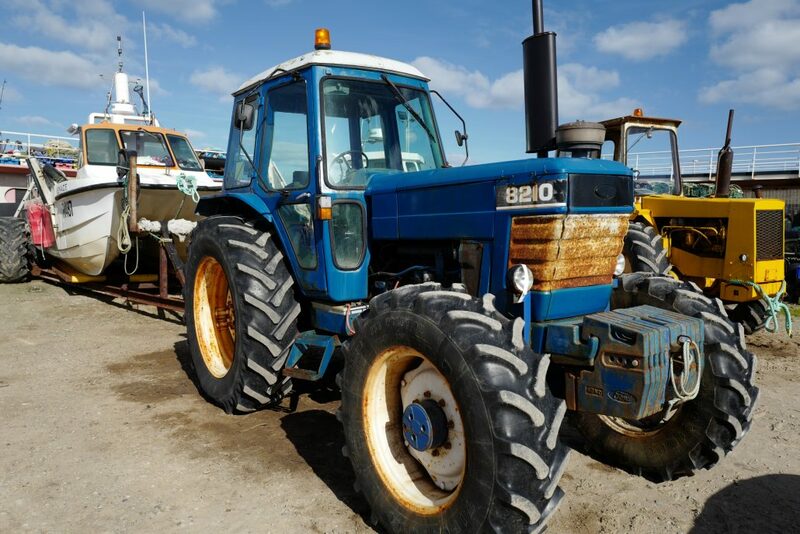 Looking forwards, the managment, maintenance and ongoing costs of operating the tractor are to be met by the Hornsea fishermen. This project was financed by Ørsted as and Agreed Donation in return for fishermen’s co-operation during a period when Ørsted were conducting pre-construction surveys in preparation for the construction of the Westermost Rough offshore wind farm. The Holderness Fishing Industry Group have been awarded funds to design, construct and build a new lobster hatchery and research facility. This exciting new development is located within the harbour of Bridlington on the sea wall and construction began in 2017. The fishermen in Hornsea are in need of a sheltered, secure and modern facility / workshop within where they can maintain their fishing gear and vessels. This project has now secured funding from the West of Morecambe Fisheries Ltd and is being developed in conjunction with the East Riding of Yorkshire council. Construction is due to begin in 2018. Several initiatives have been funded that are benefitting local fishing businesses. These include the purchase of equipment for a fish retail unit, fishing vessel refit and engine replacement, an R.N.L.I. donation to the local station, purchasing equipment for rigging a fishing vessel for whelk fishing and the refurbishment of a fishing vessel hull and decking. 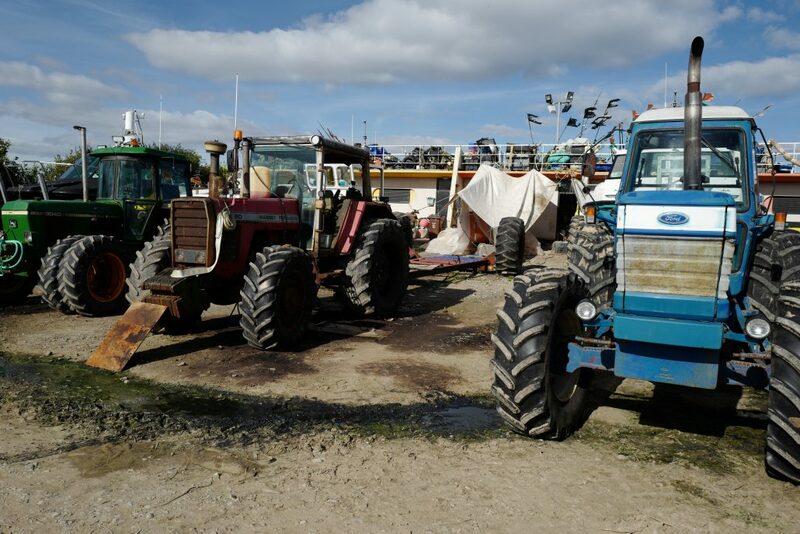 Funds have also been provided towards the purchase of a tractor and trailer fitted with a hydraulic lifting arm. The latter is used to lift large bags of cockles caught in the region. These projects were financed by Ørsted as a package of Single Business Agreed Donations in return for co-operation of the fishermen during the construction of the Burbo Bank Extension offshore wind. Awarded Community funds to finance an M.S.C. (Marine Stewardship Council) assessment of the Wash brown shrimp fishery (2016). This project was financed as an agreed donation by Ørsted in return for co-operation of the fishermen during the construction of the Race Bank offshore wind. This vehicle is used to pick up and transport shellfish catches from fishermen throughout West Cumbria (around 8 in total) to seawater storage tanks in Seascale, prior to their resale. This award received unanimous support from the Fishing Industry Advisory Group, which is comprised of fishing industry representatives from the N.F.F.O., Fleetwood, Morecambe, Heysham, Whitehaven, Maryport and Northern Ireland. This group of twenty three fisher folk were awarded funds in both 2015 and then in 2018 to buy new safety equipment for their fishing operations. Safety equipment included protective foul weather gear and M.O.B. (man over board) devices alert search and rescue services once activated, should the wearer become immersed in seawater. The fishermen were also awarded funds to purchase insulated fish boxes to improve their catch quality by keeping fish catches (i.e. salmon) at lower temperatures whilst onboard. These awards were financed by a voluntary donation from the Walney Extension offshore wind farm (2018) and an earlier joint donation made by the Walney, West of Duddon Sands and Ormonde offshore wind farms (2015). Photography by Scott Kershaw (www.scottkershaw.co.uk). 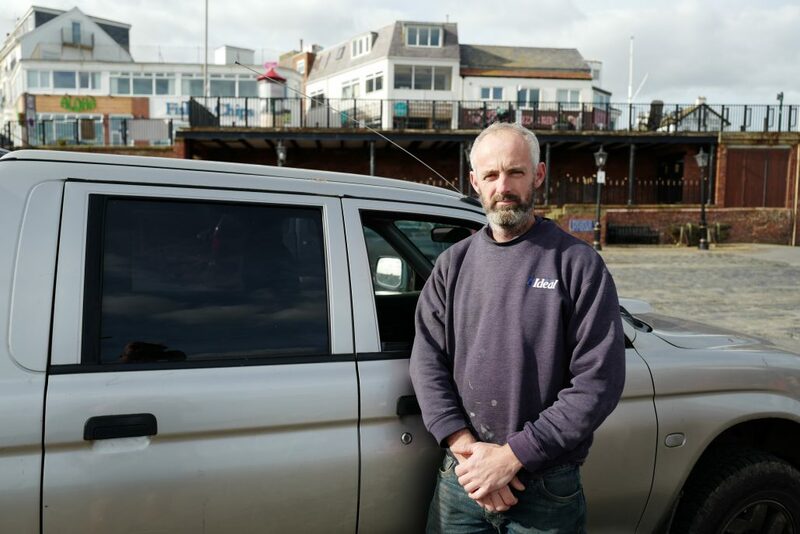 The old forklift was badly in need of replacement and the fishermen in Maryport were awarded the funds to secure a brand new replacement vehicle in 2016. Maryport, known as Alauna in Roman times, has been in existence for a very long time. Fishing is a proud tradition in Maryport and the town’s fishermen are to benefit from solar panels which are to be installed on their building in the docks. The solar panels are expected to reduce the costs of electricity, which can be considerable as the Maryport Fishing Company operates a chiller room and commercial ice machine for their members. The new ice machine and chiller unit installed in Maryport, Spring 2014. John McAvoy B.E.M. is a Director of the Maryport Fishing Company (featured below). Group photo shows John with Bronagh Byrne (Ørsted) and Kirsty Godwin (Vattenfall) representing the donor offshore wind farms and Dr Andy Revill from the West of Morecambe Fisheries Ltd. (photos by Scott Kershaw www.scottkershaw.co.uk). The Whitehaven Harbour Commissioners have been awarded funding towards a scheme to improve the facilities for the fishing industry in Whitehaven harbour. These developments will benefit both resident and visiting fishermen and includes new ramped access to the harbour wall, CCTV security, power and water to the visitors berths, laundry facilities for visiting crews, improvements to the existing ice plant, new cold storage facilities and safer vehicle access to the working quay. Funding has been provided to the Whitehaven Fishermen’s Cooperative for the purchase fish boxes, ice bins, a pallet truck and a heavy duty pressure washer. This essential shoreside equipment will be available to all fishermen in the cooperative and will help to ensure that catches are stored ashore in the most hygienic conditions possible. The refrigerated van is to transport fish landed in Whitehaven, to auctions in distant ports with a large buyer base, such as in Lowestoft and Brixham. In these ports the fish can attract optimal prices. The new forklift is to transport fish and shellfish landed into Whitehaven safely around the harbour to storage and transport facilitiies in the port. The funds enabled the Institute to be installed with cavity wall and loft insulation, refreshed exterior paintwork, new office and training equipment for the boardroom and training room. 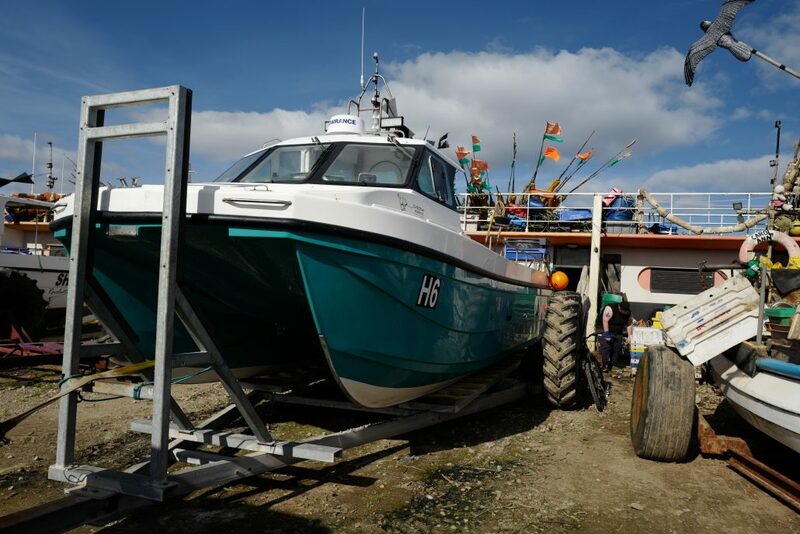 A new heating system was also installed through the building, which serves as a resource and training facility for the entire fishing fleet of Northern Ireland. This project was financed by both a voluntary donation and an Agreed Donation from the Walney Extension offshore wind farm. Photography by Scott Kershaw. The company aims to provide NIFPO members the opportunity for work as guard vessels for the oil, gas and offshore renewable industries. Funding was awarded to help fund their website, which can be seen at: www.fpoffshoreservices.co.uk. The funding awarded also enabled the company to renew their safety certifications to ISO 9001 and OHSAS 18001 standards. Located within the NIFPO Portavogie office, this donation has part-funded a much needed meeting room fitted with modern IT facilities. The new meeting room is equipped with new cupboard storage, unisex bathroom and toilet facilities, a projector, white screen, tables and chairs, and modern telecommunications. The meeting room itself has been converted from old storage areas and has been re-floored, re-tiled and re-painted during the conversion process. The Barrow and Furness Fishermen’s Association were awarded funds to purchase and install a new dockside davit crane. The davit will be used to lift and lower heavy items safely from the vessels to the quayside. The holding photographs below will be updated as this project is completed. This project was financed by a voluntary donation provided by the Walney Extension offshore wind farm. A number of boats operate from Barrow, mooring up at the back of the Dock Museum. The fishermen’s catch is shipped off to be sold in Fleetwood when it arrives on land and has to be transported to Fleetwood Fish Market. The fishermen had to buy ice to keep it fresh during the fishing and transportation process. This was an uneconomical procedure, which was reliant on an outside third party. With the installation of the new ice plant (which also acts as a refrigeration unit), approximately 750kg of ice can be produced per day thereby reducing the risk of loss of catch. This also has an addition benefit that the association and its members are compliant with Food Hygiene regulations. This process has had a huge impact on the local fishing industry, ensuring that catches are kept cool and fresh whilst being transported to Fleetwood. Currently the Association has ten members, but with the improved facility there are opportunities to recruit more members who in the long term will have a positive outcome for the association and for the local economy. St Nicholas Primary School is set in the heart of the Northern Irish Fishing Community of Ardglass. The Northern Ireland Fish Producers Organisation (NIFPO) supported the school’s bid for funding. Many of the children at the school have parents and/or relatives who are dependant upon the fishing industry and the school is proud of its links to the fishing community of Ardglass. This project was financed as a voluntary donation jointly made by the Walney Extension offshore wind farm. This project was financed by Ørsted as a Voluntary Donation in recognition of the co-operation received from the Northern Irish fishermen during the construction and operation of the Walney Extension offshore wind farm. Photography by Scott Kershaw (www.scottkershaw.co.uk). The NIWIF is entirely run by women, and it promotes, supports and raises awareness of the roles of women in the Fishing Communities in Northern Ireland. The NIWIF additionally provides a support and friendship network for women of all ages from fishing communities. This project was financed by Ørsted as a Voluntary Donation in recognition of the co-operation received from the Northern Irish fishermen during the construction and operation of the Walney Extension offshore wind farm. The Ards peninsula scout group are based in Northern Ireland. The Scout group aims to help young people in Northern Ireland enjoy new adventures, experience the outdoors, interact with others, gain confidence and have the opportunity to reach their full potential. The Northern Irish Fish Producers Organisation has members in Portavogie, Ardglass and Kilkeel. The new van will help with the distribution and delivery of chandlery and other materials essential to fishing operations in these ports. Kilkeel is a major whitefish and shellfish port in Northern Ireland with a significant turnover. ANIFPO (Fish Sales) are a subsidiary of ANIFPO (Anglo North Irish Fish Producers Organisation) based in Kilkeel fish market. The Company is responsible for the handling, storage and auctioning of the fresh fish, landed into the port. The Kilkeel and Mourne Sea Cadets aims to give young people an experience that will help them grow into the person they want to be in a safe and friendly environment. The Sea cadets facilitate various activities and adventures, whereby young people learn teamwork, respect, loyalty, self-confidence, commitment, self-discipline, honesty and how to be the best version of themselves. Students at the South Eastern Regional College in Downpatrick, Northern Ireland are developing a new safety feature in the form of a monitoring system for winches, known as the ANCPOS project. Some of the students involved are from fishing families where such winches are frequently used onboard their fishing vessels. The funding provided by WOMF is intended to progress the ANCPOS initiative further towards maturity. The Northern Irish Fish Producers Organisation (N.I.F.P.O.) have members with fishing vessels in the ports of Ardglass, Kilkeel and Portavogie. Funding has been awarded to NIFPO which will underpin the appointment of a Health and Safety professional who will provide practical advice on H and S issues, both offshore and onshore, for NIFPO and its members.